Rainer dancing Trio A (1967), 1978. 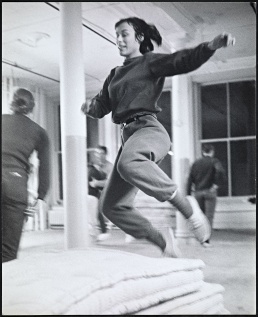 Yvonne Rainer (1934) is an American dancer, choreographer, and filmmaker, whose work in these disciplines is regarded as challenging and experimental. Rainer currently lives and works in California and New York. Hand Movie, 1966, 5:00, b&w, silent, 8mm. Volleyball (Foot Film), 1967, 10:00 b&w, silent, 16mm. Rhode Island Red, 1968, 10:00, b&w, silent, 16mm. Trio Film, 1968, 13:00, b&w, silent, 16mm. Line, 1969, 10:00, b&w, silent, 16mm. The Man Who Envied Women, 1985, 125 min. Structured around the breakup of a relationship, this often comical film presents a portrait of issues facing the New York cultural world in the 1980s, including gentrification in SoHo and the influence of poststructuralist theory within academia. "A Quasi Survey of Some 'Minimalist' Tendencies in the Quantitatively Minimal Dance Activity Midst the Plethora, or an Analysis of Trio A", in Minimal Art: A Critical Anthology, ed. Gregory Battcock, New York: E.P. Dutton, 1968, pp 263-273. "Three Distributions", Aspen 8: "The Fluxus Issue", ed. Dan Graham, New York: Aspen Communications, Fall 1970-Winter 1971. Work 1961-73, Halifax, Nova Scotia: The Press of the Nova Scotia College of Art and Design, and New York: New York University Press, 1974. "Screenplay for Film About A Woman Who...", October 2, Summer 1976. "Screenplay for Journeys from Berlin/1971", October 9, Summer 1979. "A Letter from Yvonne Rainer", October 10, Autumn 1979. The Films of Yvonne Rainer, Bloomington: Indiana University Press, 1989. Film scripts of Rainer's work and essays on them by B. Ruby Rich, Bérénice Reynaud, Mitchell Rosenbaum, and Patricia White. Feelings Are Facts: A Life, MIT Press, 2006, xvi+473 pp. Memoir. Poems, New York: Badlands Unlimited, 2011. "Judson Dance Theater: 50th Anniversary", Artforum, 10 Jul 2012. "Trisha Brown", BOMB 45, Fall 1993, pp 28-33. Liza Béar, Yvonne Rainer, Willoughby Sharp, "Yvonne Rainer", Avalanche Magazine 5, Summer 1972, pp 46-59. Shelley Green, Radical Juxtaposition: The Films of Yvonne Rainer, Metuchen, NJ: Scarecrow Press, 1994, 174 pp. Carrie Lambert, "Moving Still: Mediating Yvonne Rainer's Trio A", October 89, MIT Press, Summer 1999, pp 87-112. Erin Brannigan, "Yvonne Rainer", Senses of Cinema 27, Jul 2003. Douglas Crimp, "Yvonne Rainer, Muciz Lover", Grey Room 22, Winter 2006, pp 48-67. Catherine Wood, Yvonne Rainer: The Mind is a Muscle, London: Afterall (One Work), 2007, 118 pp. Carrie Lambert-Beatty, Being Watched: Yvonne Rainer and the 1960s, MIT Press, 2008, 382 pp. Introduction. . Review: Burton (CAA). Douglas Crimp, "Yvonne Rainer: Lehrreiches vaudeville / Pedagogical Vaudevillian", pp 247-263. Siona Wilson, "Structures of Feeling: Yvonne Rainer circa 1974", October 152, Spring 2015, pp 3-25. Radical Bodies: Anna Halprin, Simone Forti, and Yvonne Rainer in California and New York, 1955-1972, eds. Ninotchka Bennahum, Wendy Perron, and Bruce Robertson, University of California Press, 2017, 191 pp. Catalogue for exh. held at Art, Design & Architecture Museum, UC Santa Barbara, 14 Jan-30 Apr 2017. With contributions from Simone Forti, John Rockwell, and Morton Subotnick. The Yvonne Rainer Project, British Film Institute Gallery, London, 26 Nov 2010-23 Jan 2011. 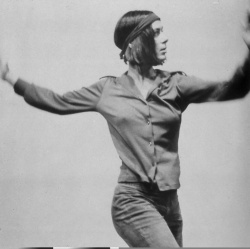 Yvonne Rainer. Space, Body, Language, Museum Ludwig, 28 Apr-29 Jul 2012. Curated by Bar­bara En­gel­bach and Yil­maz Dziewior. Yvonne Rainer: Dances and Films, Getty Research Institute, 27 May-12 Oct 2014. Yvonne Rainer: Dance Works 1961-72, Raven Row, London, 11 Jul-10 Aug 2014. Curated by Catherine Wood. Incl. video recordings of new performances of four pieces from the 1960s. Embodiment Abstracted: The Influence of Yvonne Rainer, Gallery 400, University of Illinois, Chicago, 13 Jan-4 Mar 2017. Featured 7 artists' performance and video work from the early 2000s. Curated by Elise Archias.